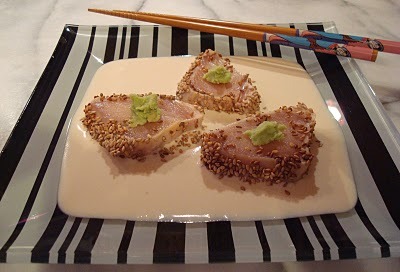 We see sesame seed crusted tuna quite often in restaurants, as tuna and sesame are a complementary combination. My tahini sauce is made with a ground sesame seed paste, lemon juice and garlic and is a perfect sauce for raw tuna. I serve it here with a dot of wasabi, crust the albacore with toasted sesame seeds, and offer tamari (soy sauce) on the side for balance. The restaurant where I get the albacore + sesame seed combination makes the crust with some wasabi too: it is really good. Your dish is quite inviting. Oh, I like the idea of mixing the sesame seeds and the wasabi, I’ll try that! Thanks. The tahini sauce looks great. Is there more than the three ingredients you described? It looks so rich and creamy! Keep up the good work on your beautiful blog. Father Adam – believe it or not, the other ingredient is WATER. I went back and forth deciding to keep the Jimmy Buffett lyrics on my blog…I WISH LUNCH COULD LAST FOREVER, I guess it should stay?? I thought those who didn’t know Jimmy wouldn’t appreciate it. Well then – Waiter, bring us one more bottle of wine!